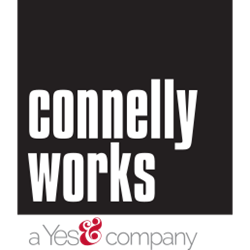 ConnellyWorks, Inc. has merged with Yes&, a newly-formed performance driven marketing agency that combines the strengths and capabilities of four communications firms into an innovative full-service agency offering clients across the government and commercial marketplace a single source for their PR, marketing, digital strategy and events needs. “This merger comes on the heels of the launch of Yes& and fills a void in the mid-Atlantic area – an agency large enough to provide end-to-end capabilities, but small enough to be flexible and agile,” said Joanne Connelly, President & CEO of ConnellyWorks, Inc.
ConnellyWorks, Inc. today announced it has merged with Yes&, a newly-formed performance driven marketing agency that combines the strengths and capabilities of four communications firms into an innovative full-service agency offering clients across the government and commercial marketplace a single source for their PR, marketing, digital strategy and events needs. For more information, visit http://www.yesandagency.com.